Protein: It’s an essential component of muscle, skin, hair, and nails, as well as antibodies, hormones, and cell structures. With confusion among consumers about how much carbohydrate and fat they should be eating, protein has emerged as the most popular macronutrient. In spite of that, protein still can be misunderstood. But before exploring—and debunking—protein myths with your clients and patients, it might be worth double-checking whether they know what protein is. Here are the top protein myths dietitians often hear from clients and consumers and the facts to set them straight. Myth: Animal protein is more easily absorbed than plant protein. In the PDCAAS, foods with lower levels of indispensable, or essential, amino acids—the amino acids you must get from food because your body can’t make them—are characterized as “lower-quality” protein.2 However, the PDCAAS and other measures of biological value don’t account for whether the food is raw or cooked and how it interacts with other protein-containing foods.1 As a result, many plant foods may have a lower value because they’re too low in an essential amino acid, something that may matter little in the context of a varied diet. Also worthy of consideration is that plant-based protein has benefits for the environment, plus it comes “packaged” with fiber, healthful polyunsaturated and monounsaturated fats, and phytochemicals. The “bioavailability myth” is one that Vicki Shanta Retelny, RDN, a Chicago-based author, speaker, and culinary consultant (victoriashantaretelny.com), hears often. “I clear it up by saying that the amino acids in plants are just as bioavailable as animal proteins and it not only helps maintain muscle mass but keeps your bones healthy, too,” she says. Myth: Vegetarians and vegans don’t get enough protein. Fact: In developed countries, at least, vegetarians and vegans get enough protein—and enough leucine.1,7 This myth likely stems in part from the bioavailability myth but also from the common worry that plant proteins, unlike animal proteins, aren’t complete. Myth: Daily protein needs for healthy adults are only 46 g for women and 56 g for men, and most Americans get too much protein. Fact: According to the 2015–2020 Dietary Guidelines for Americans, while it’s true that many (60%) Americans exceed their recommendations for protein intake, based on servings, a significant percentage (40%) falls short.9 And, as dietitians know, the recommended protein intake isn’t the same number for everyone. Myth: If more protein is good, then much more is better. Fact: While getting enough protein is important for growth and maintenance of muscle and other tissues, what may not be ideal for health and the environment, according to a substantial body of research, is consuming excess animal protein.15,16 There’s evidence that a higher-protein diet can aid in weight loss and prevention of weight gain, especially when combined with physical activity, by increasing satiety and postmeal thermogenesis, but “high” protein isn’t as high as many consumers may think. Several studies use a diet that provides 25% of calories from protein, compared with a “standard” research diet of 12% protein.5 This is still far below the 40% protein recommended by many commercial diet programs and diet books, but much higher than the RDA. Cincinnati-based Karolin Saweres, RDN, LD, founder of www.mynutritionandme.com, says one aspect of the “more is better” myth is that taking protein supplements is more beneficial for muscle growth—and the more expensive the better. North Carolina–based Judith Scharman Draughon, MS, RDN, LD, author of Lean Body, Smart Life, frequently hears this related myth: Protein gives you energy. Myth: Soy isn’t a safe protein. Myth: You can’t be vegan and lose weight because beans are too high in carbs. Myth: Too much protein is bad for the bones and kidneys. Myth: It’s difficult to get enough protein at breakfast. Fact: Breakfast is the meal where protein tends to be lowest, because foods such as oatmeal, cereal, and toast are relatively low in protein. But while it can feel challenging to meet protein needs at breakfast, it’s certainly not impossible. It’s also important, because the human body breaks down and rebuilds muscle throughout the day. • Saweres says one of her favorite delicious breakfasts is fava beans with chopped fresh tomato, green onions, cumin, salt, and pepper. 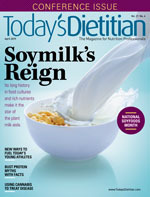 • Lisa Andrews, MEd, RD, LD, owner of soundbitesnutrition.com, recommends adding a side of black or pinto beans to eggs. “They are really filling and provide a nice dose of protein and fiber to start the day,” she notes. • Denver-based Jessica Crandall Snyder, RDN, CDE, AFAA, owner of www.vitalRD.com, also likes beans with eggs in the form of breakfast tacos, adding bell peppers and tomatoes, but her new favorite breakfasts are sweet potato hash with eggs and flavorful, nutrient-rich shakshuka—eggs baked in a spicy tomato-pepper sauce. She also recommends making breakfasts on Sundays for the week ahead. “The prep work is done and then you can ‘make time’ for fueling your body and metabolism before starting your day,” she says. • South Carolina–based Jennifer Hunt, RDN, LD, owner of www.healthy-inspiration.com, likes to pour egg whites into hot cooked oatmeal or hot cereal. “It makes them light and fluffy with a boost of protein,” she says. • Gust says parents love her suggestion to make pancakes from banana, eggs, oats, and pumpkin spice—higher in protein and fiber than traditional pancakes without added sugars. Other winners are egg breakfast muffins—aka omelets in muffin tins—stirring peanut butter into hot cereal, and rolling fruit slices in chia, flax, or hemp seeds to provide “grip” and add some protein—great for babies and toddlers. 1. Paddon-Jones D, Coss-Bu JA, Morris CR, Phillips SM, Wernerman J. Variation in protein origin and utilization: research and clinical application. Nutr Clin Pract. 2017;32(1_suppl):48S-57S. 2. Marinangeli CPF, House JD. Potential impact of the digestible indispensable amino acid score as a measure of protein quality on dietary regulations and health. Nutr Rev. 2017;75(8):658-667. 3. Bauer J, Biolo G, Cederholm T, et al. Evidence-based recommendations for optimal dietary protein intake in older people: a position paper from the PROT-AGE Study Group. J Am Med Dir Assoc. 2013;14(8):542-559. 4. Devries MC, McGlory C, Bolster DR, et al. Leucine, not total protein, content of a supplement is the primary determinant of muscle protein anabolic responses in healthy older women. J Nutr. 2018;148(7):1088-1095. 5. Arentson-Lantz E, Clairmont S, Paddon-Jones D, Tremblay A, Elango R. Protein: a nutrient in focus. Appl Physiol Nutr Metab. 2015;40(8):755-761. 6. van Vliet S, Burd NA, van Loon LJ. The skeletal muscle anabolic response to plant- versus animal-based protein consumption. J Nutr. 2015;145(9):1981-1991. 7. Sanders TA. The nutritional adequacy of plant-based diets. Proc Nutr Soc. 1999;58(2):265-269. 8. Marsh KA, Munn EA, Baines SK. Protein and vegetarian diets. Med J Aust. 2013;199(4 Suppl):S7-S10. 9. US Department of Health and Human Services. 2015–2020 Dietary Guidelines for Americans, 8th ed. Chapter 2: shifts needed to align with healthy eating patterns. https://health.gov/dietaryguidelines/2015/guidelines/chapter-2/current-eating-patterns-in-the-united-states/. Published January 7, 2016. 10. Phillips SM, Chevalier S, Leidy HJ. Protein “requirements” beyond the RDA: implications for optimizing health. Appl Physiol Nutr Metab. 2016;41(5):565-572. 11. Volpi E, Nazemi R, Fujita S. Muscle tissue changes with aging. Curr Opin Clin Nutr Metab Care. 2004;7(4):405-410. 12. Moore DR, Churchward-Venne TA, Witard O, et al. Protein ingestion to stimulate myofibrillar protein synthesis requires greater relative protein intakes in healthy older versus younger men. J Gerontol A Biol Sci Med Sci. 2015;70(1):57-62. 13. Wall BT, Cermak NM, van Loon LJ. Dietary protein considerations to support active aging. Sports Med. 2014;44(Suppl 2):S185-194. 14. Deutz NE, Bauer JM, Barazzoni R, et al. Protein intake and exercise for optimal muscle function with aging: recommendations from the ESPEN Expert Group. Clin Nutr. 2014;33(6):929-936. 15. van Nielen M, Feskens EJ, Mensink M, et al. Dietary protein intake and incidence of type 2 diabetes in Europe: the EPIC-InterAct Case-Cohort Study. Diabetes Care. 2014;37(7):1854-1862. 16. Levine ME, Suarez JA, Brandhorst S, et al. Low protein intake is associated with a major reduction in IGF-1, cancer, and overall mortality in the 65 and younger but not older population. Cell Metab. 2014;19(3):407-417. 17. ACS guidelines on nutrition and physical activity for cancer prevention: common questions about diet and cancer. American Cancer Society website. https://www.cancer.org/healthy/eat-healthy-get-active/acs-guidelines-nutrition-physical-activity-cancer-prevention/common-questions.html. Updated February 5, 2016. 18. Messina M. Soy and health update: evaluation of the clinical and epidemiologic literature. Nutrients. 2016;8(12):E754. 19. Farmer B. Nutritional adequacy of plant-based diets for weight management: observations from the NHANES. Am J Clin Nutr. 2014;100(Suppl 1):365S-368S. 20. Ludwig DS, Willett WC, Volek JS, Neuhouser ML. Dietary fat: from foe to friend? Science. 2018;362(6416):764-770. 21. Gardner CD, Trepanowski JF, Del Gobbo LC, et al. Effect of low-fat vs low-carbohydrate diet on 12-month weight loss in overweight adults and the association with genotype pattern or insulin secretion: the DIETFITS randomized clinical trial. JAMA. 2018;319(7):667-679. 22. Shams-White MM, Chung M, Du M, et al. Dietary protein and bone health: a systematic review and meta-analysis from the National Osteoporosis Foundation. Am J Clin Nutr. 2017;105(6):1528-1543. 23. Mitchell PJ, Cooper C, Dawson-Hughes B, Gordon CM, Rizzoli R. Life-course approach to nutrition. Osteoporos Int. 2015;26(12):2723-2742. 24. Is protein and phosphorus hard on kidneys? National Kidney Foundation website. https://www.kidney.org/blog/ask-doctor/protein-and-phosphorus-hard-kidneys. Published May 15, 2012. 25. Halbesma N, Bakker SJ, Jansen DF, et al. High protein intake associates with cardiovascular events but not with loss of renal function. J Am Soc Nephrol. 2009;20(8):1797-1804. 26. Bilancio G, Cavallo P, Ciacci C, Cirillo M. Dietary protein, kidney function and mortality: review of the evidence from epidemiological studies. Nutrients. 2019;11(1):E196.